Like it does. Twice a year. Anyway. With the no walls or doors thing ... I don't tend to go all that big with decorating. Is that lazy of me? There's nothing to ATTACH things to but the ceiling. And if I have to spend a bunch of money buying trash cans and spray paint and pool noodles then we're not MAKING money. I actually like the geeky Story Laboratory theme Scholastic is doing but it doesn't seem like it will fit in our space. Or is that a bah humbug attitude? 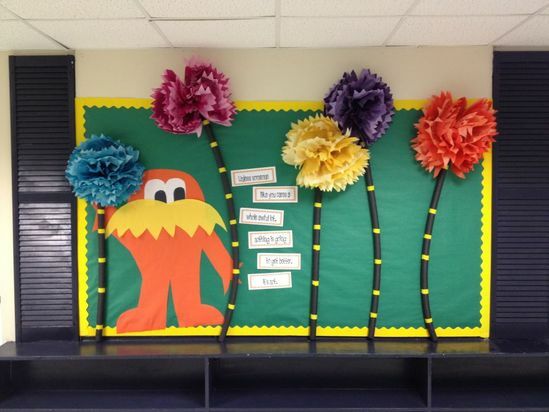 Cari is doing a Seuss theme. That might work. Was also contemplating a Buggy for Books theme because that's springy and I could leave it up through April and the kids could make some decorations. Anyway. Here are some pins that I've found helpful or interesting as I get started planning. It's in a month. Love this but no walls and out in the middle of the floor kids would knock into it and destroy it within minutes. Plus money AND time. This pin doesn't actually go anywhere and I can't seem to find it just searching by the title ... but the idea is cute for a decoration. May reinvent this wheel if we go with this theme. Also I have some cute die cut bug patterns for my Silhouette Cameo. But then again there are cute bug party treats. And this would be pretty cheap. And maybe some Seuss related stuff that the artists had to take down but hey, I'd already purchased.